Free continental breakfast free Wi-Fi and an indoor pool lure our guests to La Quinta Inn & Suites Dickinson. The four-floor La Quinta Inn has 79 rooms that include coffeemakers microwaves mini-fridges free Wi-Fi and flat-panel TVs with cable channels. Non-smoking rooms are also available. Pour some syrup on the fresh waffles at the free breakfast and enjoy. 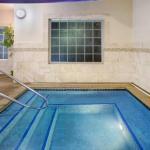 Pair a refreshing swim in the indoor pool with a soothing soak in the hot tub. The hotel also has a convenience store a business center a laundry facility and free parking. Pets are allowed for no fee. The La Quinta is right off I-94 near shopping and a half-mile from the Dakota Dinosaur Museum. Downtown Dickinson is about a mile away. U.S.-85 is about 20 miles from the hotel and Theodore Roosevelt National Memorial Park is a 36-mile drive. Bismarck and Bismarck Airport are about one hour and 40 minutes by car.